This incredible program actually allows you to quickly and easily generate custom Internet Explorer toolbars for your website or search engine. It also lets you change your toolbar as much as you like and as often as you like. Now you can create your own toolbar or you can create toolbars for your affiliates or JV partners in just 9 easy steps! The Viral Toolbar Builder allows you to custom build toolbars just like Google and Yahoo and numerous other companies have recently done! Your logo or brand prominently displayed! Up to 10 buttons including buttons that link to your services as well as a popup blocker button, a cookie cleaner button, a translation button and much, much more! Ad buttons that can rotate by clicks or time! A search button and much more! Thanks to the Viral Toolbar Builder, building a useful toolbar is so easy even a fourth-grader could do it! And the toolbar you create will be of a small file size for easy downloading (even by dial-up connection). 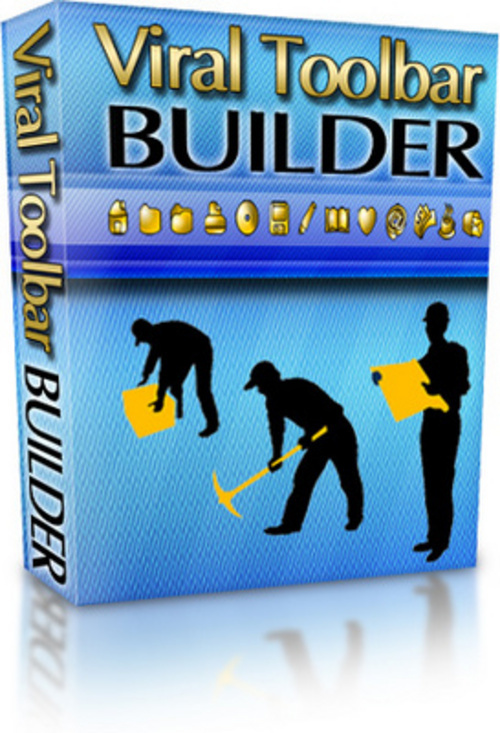 The toolbar is also easy to maintain, in fact, the Viral Toolbar Builder software program will allow you to change or update a toolbar in seconds! Includes to sales pages, one text and another with graphics. Also includes numerous cover images in different sizes. PSD are also included, as well as black graphics so you can customize as you need. "Discover How to Submit Your Viral Articles to All of the Top Websites With a Simple Click of Your Mouse!" Using viral articles can be a great way to get free advertising for your website! Unfortunately, when it comes to viral articles writing them or paying to have them written is only half the battle. Once you have your articles completed, you still have to submit them to websites. Now thanks to the Viral Article Publisher software program, you can submit your viral articles to all the top websites with a simple click of your mouse! Submitting Viral Articles Has Never Been This Fast or Easy! No longer do you have to manually visit each website to submit your article! No longer do you have to limit yourself to submitting your article to one website at a time! No longer do you have to search for websites to submit your article to! Thanks to the amazing Viral Article Publisher software program, you can now actually select as many of the top article-accepting websites as you want and submit your article instantly to them all at once by clicking a simple button! Once you use this program and experience its convenience you are sure to wonder how you ever got along without it! of the Full Power of Viral Article Marketing! By simplifying the submission process dramatically, the Viral Article Publisher paves the way for your article to spread like wildfire throughout the Internet. Soon thousands upon thousands of people will be reading it and seeing your resource box information which ultimately means more website traffic and more sales for you! Not sure how to create a good resource box? Dont worry, the Viral Article Publisher program contains a tab that will guide you step-by-easy-step through creating a resource box that is sure to send customers flooding to your site! All of Your Viral Articles! The Viral Article Publisher is an invaluable software solution, which is extremely easy to use and which saves you from having to submit articles manually to all of the top free article sites though it does contain that option in case you want to hand submit an article to one or a few select sites. With the Viral Article Publisher, you can make just one click and submit your article to as many article sites as you want! In todays ultra-competitive marketplace, where everyone is looking for an advantage and a persons time is of maximum value, this software program could be just the tool you need to increase your free advertising and explode your profits! The Viral Article Publisher makes it easier than ever before for you to get free advertising while also freeing up time that you used to waste remembering or locating website addresses and then typing them into your web browser. Thanks to the Viral Article Publisher, youll be able to use that newfound extra time to grow your business and increase sales! Allows you to submit an article to as many sites as you want! Saves you a tremendous amount of time that you can use to grow your business or spend with your family! Streamlines your article submission process by eliminating frustrating searches as well as any typing errors and incorrect web address entries that you may make! Prevents you from having to go through your endless list of article sites to find each one that you want to submit an article to and then visit them manually! Publisher Allows You to Do! The Viral Article Publisher also allows users to make manual submissions when you want to selectively submit a particular article to select websites. Stop wasting your valuable time manually visiting each website you want to submit an article to! Getting the Viral Article Publisher is a golden opportunity to streamline your article submission process and increase your income online. Inefficiency is one of the main reasons so many Internet businesses fail today. Remember in todays competitive Internet marketplace, you need every advantage you can get and the Viral Article Publisher is a great way to ensure you dont spend too much time remembering and entering web addresses and too little time growing your business. >> A ready-to-sell graphic web page that you add your Personal and Payment information to. A plain text sales page is also included and can be easily copied and pasted into any existing web site. >> The Word Document source file of a Professionally Written 7 page Salesletter. This alone has a minimum value of $600.00!! >> A complete graphics package from our Professional Graphic Designers that includes: 25+ website ready images, Blank JPG's to add your text to and ALL the Layered PSD Source images. BONUS: This package includes 4 pre-made banners! >> A ready-to-sell Software Setup Executable file. Just upload the EXE to your server and you're ready to start fulfilling orders! >> ALL the Software Source files. You or your programmer will simply brand the setup with your information and links, compile them and you're ready to start selling YOUR software! * Allows you to submit an article to as many sites as you want! * Saves you a tremendous amount of time that you can use to grow your business or spend with your family! * Prevents you from having to go through your endless list of article sites to find each one that you want to submit an article to and then visit them manually! * Streamlines your article submission process by eliminating frustrating searches as well as any typing errors and incorrect web address entries that you may make! P/S : In fact, right now, for a limited time, you can take advantage of a special promotional offer and receive Viral Article Publisher Software for just $59 thats a full Discount 60 percent off the regular price of $147!